It starts with the battle of Ganjikota which played very important role in Shaikh Fateh Mohammed’s life. He fought from the side of Nawab Abid Khan of Sira. He was not the commandant of the entire army of Abid khan in the war. Actually the fort of Ganjikota was quite strong and the Ganjikota army fought pretty well. It made a number of causalities and remarkable loss to the army of Abid Khan . Abid khan himself was not at the battlefield, but his son was the commandant of his army and leading it. Due to the strong defence of Ganjikota army, and loss to his own army, Tahir Khan decided to run away from the battlefield. It is a well known fact that without a leader, even the biggest army can do nothing. As there is no decision maker, the army can be converted into a crowd in such time. So the army of Abid khan was about to divide in chunks and there will be no co-ordination then after. But, Shaikh Fateh Mohammed used his brain and bravery to prevent that being happened. He lead the army and attacked the fort of Ganjikota with full force. The cheered up army of Abid Khan thus conquered the fort of Ganjikota. And thus, the certain loss of battle is converted into the victory for Abid Khan. This made Abid Khan very happy of course. And as he know, all this could have happened only because of timely actions taken by Shaikh Fateh Mohammed, he not only praised him but also presented him with gifts and promoted in army as well. But as it is said, when you achieve success, you knowingly or unknowingly create your enemies. Of course, this thing didn’t go well with Tahir Khan. To add to the matter Abid Khan also gave Shaikh an additional duty! What was that? Well, you need to watch the episode in order to know it. It was very significant duty, which played a key role in the life of Shaikh. If to say about the background music it is definitely up to the mark. The tunes you hear when the war is going on, or when Abid Khan’s court was shown, represents the environment pretty authentically. The sets are good and so do the camera angles. During the war scenes you can recognize that it is not a real war and the stuntmen are playing it. It is a down point we can say. Though, in the scene when the war was complete, you can see the Ganjikota soldiers’ dead bodies spread over the path, over the canons etc, gives a realistic view. The DVD quality is quite good. The actors playing Shaikh and the Tahir Khan plays their part convincingly. The actor playing Abid Khan fails creating impression though. Overall mix performances in terms of acting. In historical dramas horses play a vital role. Horses were not only the best way for traveling those days, but the battles were also fought and won with the powerful horses. The incidents of the faithful horses are not unknown to us. Be it Chetak of Maharana Pratap or others, horses were like heroes of the war. 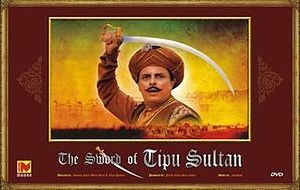 In – The Sword Of Tipu Sultan – the director was able to represent the horses splendidly. Our verdict: If you like to see historical dramas, you will like to go for The Sword Of Tipu Sultan. Note: It is a set of 12 DVDs by Ultra.